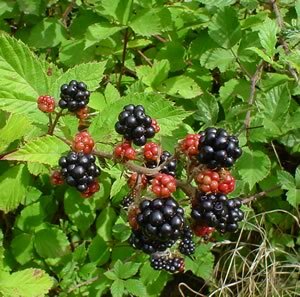 There is an Irish word that means abounding in blackberries: smearacha. This is one of the things I love about the Irish language; it seems at it’s roots to have a natural poetics. Perhaps this is just my outsider’s perspective. Perhaps all languages seem more poetic than the one that has always been mundane on your own tongue. But Irish seems meant to be beautiful before utilitarian. I have wondered sometimes if this is why Ireland has produced a disproportionate number of excellent writers for such a small place, though I am certain that this is my romantic imagination rather than any real causality. I think of this word when summer berries are in season and I buy carton after carton because I cannot get enough of the sweet, sometimes tart burst of juice that means summer. I love all kinds of berries, but blackberries are my favorite, especially when they are perfectly ripe and have a deep, settled, edgeless sweetness. Unlike other, tarter berries, like raspberries, the blackberry softens into ripeness with no need to prove itself by shocking your taste buds. It tastes like shade and cool breezes and lingering twilights dotted by fireflies. It tastes like Grandmother’s house. When we were young, Grandmother kept what seemed to me an extravagant garden, bursting with lively green vegetables, tall corn, sprawling squash and melons. And somewhere near what I imagined to be the center was a huge blackberry bush, briared and reaching, nestled into the sandy earth. In the summer when we would visit, Grandmother would arm my brother and me with tomato-red plastic buckets with slender metal handles—which once had contained a gallon of Gandy’s ice cream—and send us out to the garden with instructions to pick only the ripest berries. So out we would go, our erst-while ice cream buckets swinging in our hands, our bare feet burning in the sun-baked dirt as it squeezed up between our toes and covered us in a layer of West Texas dust. And we would harvest as many of the dark purple berries as we could find, never quite avoiding the briars, occasionally consulting over the ripeness of one, marveling at the size of another, and sampling some of our selections. But not many, because these berries were meant for better things—homemade jams and cobblers served warm with homemade ice cream (or Gandy’s out of the bright red buckets)! Grandmother always knew the best things to do with our berries, beginning with a bowl of granulated sugar which she would set out on the table. We would roll our berries in the sugar, one at a time, until they were just lightly coated in tiny crystals stained purple from the juice. And then we would pop them into our mouths, sun-ripened and sugar sweetened—better than any candy. A childhood abounding in blackberries. Mmmmm. I love everything about this. (What a great word.) Raspberries are my favorite, and they bring up many similar memories for me – pushing my way through the briars on my grandparents’ farm, snapping beans into a metal bowl, hauling hay with my granddad. Wonderful. I love your memories and well you articulate them and take all of us back to those special times!